A kitchen remodel can inspire the household to start cooking or get the family socializing. Start with the kitchen when remodeling your home and witness the transformation it can make. Expanding the kitchen space and bringing in more light can inspire the household. A kitchen remodel includes selecting a design. The design needs to include the flooring style, lighting, fixtures, and kitchen cabinets. Our custom design specialists use the latest design software and technology to imagine a kitchen remodel the entire household will love. Custom design work includes working closely with our customers and bringing their own personal taste and style to the remodel. Many times, homeowners need to expand the kitchen for an expanding and growing family. Kitchen remodel expansion ideas include building a kitchen island, removing a wall or finding creative ways to build space-saving kitchen cabinetry. At Lumina Builders Inc., skiled general contractors bring remodeling designs and ideas to life. 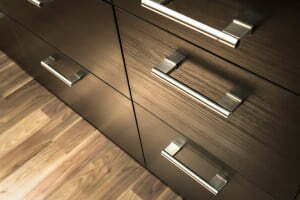 Cherry wood, maple, oak, these are just a few of the most popular wood choices for kitchen cabinets. 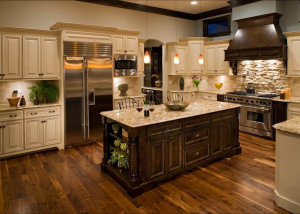 Selecting a dark wood style can add a rich, upscale look to the kitchen. Kitchen CabinetsDark cherry wood creates an elegant and contemporary look and feel to the kitchen. Space-saving ideas include raising the kitchen cabinets higher off the ground. Lumina Builders know how to remodel kitchens according to the specific needs and wants of our customers. Contact us to discuss exciting kitchen remodeling ideas, designs and construction. Even a smaller kitchen can look bigger with the right color selections. Lumina Builders Inc. are color specialists. 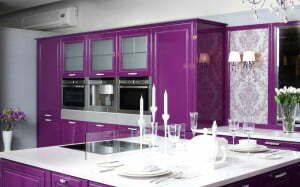 We match the perfect colors to complement the kitchen cabinet, appliances and other fixtures. Flooring patterns and tile selection can make a smaller room look bigger. Color selection goes a long way in deciding the look of the kitchen. Stark contrasts are popular among our customers. Marble tile, hardwood floors, these are all options that affect the look of the kitchen. Combining a lighter look with a darker look is an excellent contrast that can make a kitchen look much bigger. Contact a Lumina Builders Inc. representative to discuss color and wood material options. Our remodeling experts offer a free in-house consultation for kitchen remodeling projects. Our consultation provides flooring samples such as tile and hardwood options. We provide suggestions on appliances and fixtures. For expanding the kitchen space, we provide measurements that may include the removal of drywall. One thing is certain, a free in-home consultation makes the kitchen remodeling process smooth and easy. Contact us for expert an kitchen remodel that inspires.